Women walk in groups to fetch water from the Nile River near the UN camp for Internally Displaced People (IDPs) in Malakal, South Sudan. On February 15th, South Sudan’s President Salva Kiir stepped out for a rare public appearance. The youth wing of the ruling Sudan People’s Liberation Movement (SPLM) party had organized a rally. The event’s theme, coming exactly two months after the start of the fighting that has split South Sudan: One People, One Nation. The normally reticent president had got into the spirit of the day, trading in his trademark outfit – a sober suit and black cowboy hat – for a bright red polo shirt emblazoned with the South Sudanese flag and a matching baseball cap. But the tone of Kiir’s February appearance could not have been further removed from that dystopian television broadcast. This time the president was playing to the crowd, all handshakes and smiles. And his speech struck a conciliatory theme from the outset. It was an odd note for the president to strike on a day dedicated to unity. But while reconciliation was the theme, it may be a mistake to assume it tops the Kiir administration’s agenda. From the moment Kiir dug his military fatigues out of the closet and went public with the coup allegations, his administration has been intent on turning Machar and his allies into pariahs – both domestically and internationally. Officials carry copies of a booklet, entitled “The Truth About the Aborted Coup of Dr. Riek Machar and His Group,” on their house calls to regional leaders. A hearing on treason charges for four of Machar’s former SPLM allies continues in Juba, never mind that two prosecution witnesses have said under oath they cannot link the political prisoners to an alleged coup. Five other witnesses, including the minister of interior, have not even bothered to show up. And a third round of peace talks has stalled in Addis Ababa amid recriminations from both sides. The tragedy is that the political squabble is being allowed to fuel a humanitarian catastrophe. The number of displaced has grown to 800,000 and the United Nations (UN) is warning that 4.9 million people will need some kind of assistance this year. In displacement sites around the country, people beg to be evacuated to Uganda, Kenya, even Sudan – the country they fought for decades to escape. They say they do not ever want to return to South Sudan. So long as he is able to satisfy his base, protect his capital and sustain his pocketbook by keeping the country’s oil flowing, Kiir can continue to grind out Machar’s rebellion – or at least consign his foe’s forces to the country’s vast swathes of ungovernable territory. Meanwhile, the clashes have afforded his administration the cover to exorcise its key political opponents and fully clamp down on critical elements of civil society and the media. It is a gamble that has prolonged the suffering of hundreds of thousands of people and is drawing the ire of South Sudan’s international allies. But if it succeeds, Kiir could emerge with a virtually uncontested hold on power in the country. After southern rebels struck a peace deal with Khartoum in 2005, Machar became Kiir’s biggest political threat, not least because of ethnic loyalties. Kiir is a Dinka, South Sudan’s largest ethnic group; Machar hails from the second largest, the Nuer. As the president assembled his new administration, doling out rewards to loyal supporters and buying off potential rivals, he reserved the biggest plum – the vice presidency – for Machar. The move was also strategic, allowing the president a close watch on a man whose loyalties have been in doubt ever since he went turncoat on the southern rebellion in 1991 – only to rejoin more than a decade later. Though temporarily successful, the appointment ultimately failed to quell Machar’s political ambitions. By early 2013, it was an open secret that he was chafing under Kiir’s leadership and planning to challenge for chairmanship of the SPLM – the natural stepping stone to the presidency. So it was hardly surprising when, a few weeks after the country celebrated its second independence anniversary, Kiir decided he no longer wanted to carry a team of rivals and sacked his cabinet, including his vice president. Juba held its breath. A few days after his firing, Machar called a press conference at his house and calmly accepted the decision. He confirmed that he would stand for the party chairmanship, took a potshot at Kiir – “I believe this country must go democratic. If it is going to be united, it cannot tolerate one man’s rule.” – and then went silent for several months. Juba exhaled. It turns out the SPLM’s anti-Kiir forces were just biding their time. In early December, a coalition of heavy hitters, including then party Secretary General Pagan Amum and Rebecca Nyandeng, widow of the independence hero, John Garang, called a press conference at the SPLM headquarters. Machar gave an explosive speech accusing the Kiir’s administration of financial obfuscation and “driving our beloved Republic of South Sudan into chaos and disorder,” though myopically failing to take any responsibility despite his own two-year berth in the cabinet. Machar’s particular problem, though, was the charge that Kiir had amassed powers to his office by undermining regional leaders and, in two particular instances, violating the transitional constitution. The document allows the president to remove an elected governor in the “event of a crisis in the state that threatens national security and territorial integrity.” In January 2013, Kiir fired the governor of Lakes state and appointed a caretaker without bothering to present any national security risk. He did the same thing seven months later in Unity state. Neither state has held elections to choose a new governor, despite a constitutional mandate to do so within 60 days. “The SPLM chairman has completely immobilized the party, abandoned collective leadership and jettisoned all democratic pretensions to decision making,” charged Machar that December afternoon. The former vice president was by no means the first to raise those issues. A nascent civil society and political columnists had been hammering Kiir’s government on the same issues for months. Had Machar asked, they would surely have had more material for his speech. By that time, reports of harassment and detention of independent journalists were common. And it was hard not to read subtext into the security organs’ ongoing failure to address the December 2012 murder of the provocative columnist Isaiah Abraham. The government had also shied away from backing the institutions that could have helped the state cohere, including a constitutional review commission and a national peace and reconciliation committee created to address grievances collected during the decades-long war against Khartoum. And then there were national elections, scheduled for next year. The transitional constitution demands a census come before elections; officials estimate the counting will take at least two years. It has not started. Near the end of 2013, people were beginning to cotton on to the fact that either the 2015 elections would move forward without official population numbers, leaving results wide open to fraud allegations, or they would be postponed. Against a backdrop of mounting concern over South Sudan’s political trajectory, Machar gave his speech. Unlike the journalists and activists who were already banging that particular drum, Machar had the clout to push the concerns to the fore. The next week he and his allies walked out on a party meeting called to discuss a new constitution and manifesto for the SPLM. Hours later Juba exploded. Within days half of the country was at war. It’s not clear how directly you can link Machar’s more aggressive posturing to the firefight that erupted in the Juba military barracks and everything that came after. But at the very least, the speed with which hundreds of soldiers turned against the government seems to indicate that his critique may have struck a nerve. That spin has gained some traction among the country’s intellectual class, who are scrambling to help right the political system. A collection of academics and civil society leaders has put in a request to participate in the ongoing peace talks in Addis Ababa. The goal once they get to the table, explained Zachariah Diing Akol, a director at the Juba-based think tank, the Sudd Institute, is a complete government overhaul. So far, both the government and the opposition have ignored their request. Across town, the electoral commission is still waiting for Kiir to make a choice – delay the vote or move forward without a census – before pushing the decision to Parliament for a rubber stamp. If there is going to be an election, it needs to happen in less than a year. The country’s months-long rainy season means, come April, much of South Sudan becomes impassable. If the president waits too much longer a vote will be logistically impossible and there will be no choice to make. At the very least, Moro believes the two sides can reach a negotiated policial settlement, modeled on the power-sharing government that President Mwai Kibaki adopted in the wake of Kenya’s post-election violence in 2007 and early 2008. Kibaki appointed Raila Odinga, the main opposition candidate, to the newly created position of prime minister, complete with a legitimate political portfolio. The professor is convinced the system could work in South Sudan, where “we have this history of people falling out and later on coming together. The guy in power and people close to him creating space for people who rebelled to come in.” At the very least, it would end the fighting that has been allowed to obscure every other debate. Why Hilda kills People of South Sudan? No one is planning a Machar homecoming anytime soon. Both sides remain openly antagonistic and the government maintains its indifference toward the Addis Ababa peace talks, which would be the conduit for any agreement. Instead, the administration seems more intent on cleaning the house of real and perceived rebel supporters. The Warrap state information minister, for one, claims national security officials forced her out of her position because she had a conversation with one of the alleged coup conspirators. Civil society leaders have fared little better. In one particularly startling incident, unidentified armed men raided the house of Biel Boutros Biel, the director of the watchdog group South Sudan Human Rights Society for Advocacy. He quickly joined a handful of the country’s other vocal civil society leaders in exile, a safe distance from any more unwanted visits but too far to keep a close eye on the administration. Sensing which way the wind is blowing, members of actual opposition parties are lining up behind the SPLM. Dr. Lam Akol, who heads the SPLM-Democratic Change party, is actually part of the government’s negotiating team in Addis Ababa. That has left to the international community – the UN Mission in South Sudan (UNMISS), international human rights groups and donor governments – the task of holding the government accountable and combating its increasing insularity. As fighting continues and the peace process drags on, they seem to be warming to the task, though it appears they may only be succeeding in straining their relations with the government. 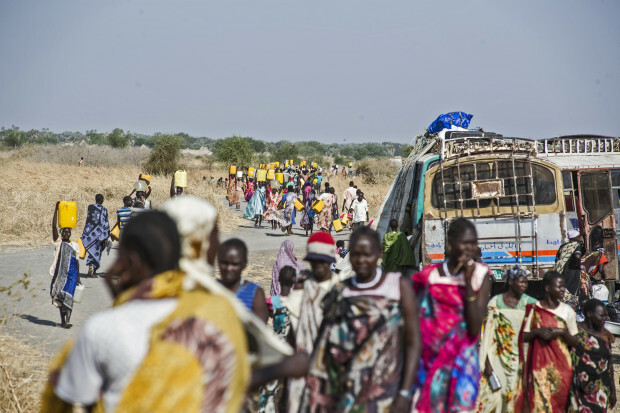 Representatives from 10 countries and the European Union recently condemned both the administration and the rebels for “violations and abuses of human rights.” U.S. President Barack Obama followed a few days later with an Executive Order that paves the way for sanctions against anyone who is deemed responsible for continued abuses, as well as parties who threaten South Sudan’s peace, stability and security. The joint statement earned a stinging rebuke from Deputy Foreign Affairs Minister Peter Bashir Gbandi, who called it “a grave violation of diplomatic practice and rules, as well as a serious interference in the internal affairs of the Republic of South Sudan,” before demanding an apology from each of the countries. They declined. Kiir’s administration is still formulating an official response to the U.S.’s sanctions threat. UNMISS has come in for particular ire. In part, it is because the omnipresent Mission has been increasingly – and justifiably – strident about the mounting humanitarian crisis. UNMISS head Hilde Johnson is warning that the recently commenced rainy season will turn some displacement camps into “death traps,” the open streams running through the sites carrying the threat of cholera, typhoid and other waterborne diseases. Even if it were safe to leave, there is little relief to be found outside the camp, where as much as half of the country’s people will not get enough to eat this year. Couched in UNMISS’s warnings is an implicit – and increasingly explicit – rebuke of the government and the rebels for allowing the crisis to reach this point. At the same time, some recent missteps have left UNMISS vulnerable to criticism and hastened the deteriorating relationship between the government and the Mission. The most unfortunate moment came in early March when South Sudan security forces discovered weapons in a UN convoy headed to Unity state’s capital, Bentiu, just shy of the frontline. UNMISS, which is only supposed to transport peacekeepers’ weapons by air, called it a mistake and ordered an immediate investigation. The government’s response was to require a search of all UN convoys each time they pass a security checkpoint – a costly and time-consuming process that will delay ongoing food distribution. The SPLM youth wing, detecting a conspiracy to arm rebels, called an anti-UN march in Juba. They even provided photo-shopped signs of Johnson leveling a gun, underneath the caption: Why Hilda kills People of South Sudan? And so it has gone for nearly four months; the government meeting its critics with threats, obstruction, redirection or evasion – even as a possible famine looms. Humanitarian crises aside, there should still be some concern in the presidential palace. Machar is telling any reporter willing to make the trek to his base near the Ethiopian border he is planning to attack the Upper Nile state oil fields. It is the strategically sound move for anyone intent on loosening Kiir’s grip on power. The president’s bet relies on continued oil production – the source of nearly all of the government’s revenue. Already, combined production from the country’s Upper Nile and Unity state fields is down a quarter from when the fighting started, with reports that the Unity fields might have suffered severe damage during early clashes. The finance ministry, notoriously tightlipped about the state of the country’s reserves, has remained unsurprisingly silent on just how severe the impact of the production cuts has been. But the country is just emerging from austerity, after a row with Sudan – the South’s only conduit for exporting the crude – precipitated a 15-month shutdown. The wells only restarted a year ago, so any decrease is bound to hurt. The answer to just how much might have come when wounded soldiers recently left their hospital beds twice in two weeks to shut down Juba’s streets and demand their salaries. They said they have not been paid since January. The fear now is not that Machar’s forces take the oil fields, but that they destroy the oil fields, leveling a devastating blow to the country’s economy and – possibly – sending more people to the streets. Whether that threat – or any threat – will succeed in getting Kiir to the negotiating table in earnest, when the destruction of three state capitals, the deaths of thousands of people and the displacement of hundreds of thousands more has not, is anyone’s guess. Having now succeeded in sidelining most of his critics, Kiir alone must decide whether he is willing to trade power for peace. Great article, I appreciate the use of SSudanese perspectives.